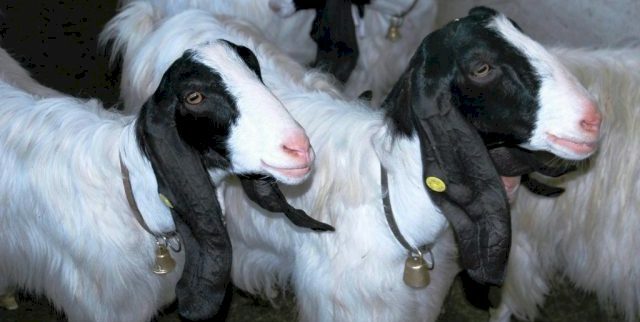 Maltese goats are long-haired white goats with a raven-black area on the top and sides of their heads and long pendulous black ears that turn outwards at the tip. In Italy, the Maltese is one of the eight autochthonous Italian goat breeds for which a genealogical herdbook is kept by theAssociazione Nazionale della Pastorizia, the Italian national association of sheep- and goat-breeders.The herdbook was established in 1976.The Italian population of the breed was estimated in 1983 to be about 70,000, and in 2005 at 40,000. At the end of 2013 the registered population reported was 1934. Maltese Goats are valuable dairy goats. The milk has a pleasant taste without an excessively "goaty" odor or flavor. Yield per lactation is 242 ± 87 liters for primiparous, 307 ± 141 l for secondiparous, and358 ± 160 lfor pluriparous, nannies; it may reach 500–600 kg in 300 days.The milk has an average of 4.28% fat and 3.66% protein.In Sicily the milk is used to make ricotta and traditional caprino cheeses includingPadduni, which has PAT status, andFormaggiu ri crapa.